From One to Many: How manufacturers can easily embed their 3D CAD Catalogs with interactive 3D previews onto several Distributor websites to boost online product sales. How long do you search before you look toward your own ecosystem – your distributors? Your relationship with your distributors is symbiotic. You want to work with the best distributor to get your products in front of more people; they want to work with the manufacturers that sell the product engineers want most. The manufacturer and distributor are teammates – so why not share the same tools? If you have a 3D CAD catalog, consider the impact that 3D CAD downloads and product visualization can have on your distributor purchases. Say hello to more leads: Learn why a digital catalog is an industrial component manufacturer’s best friend. First-things-first: Sales. As a manufacturer, it’s important to know where you see the most online product sales. Does your revenue come from distributors? A third-party part download portal? Or your website’s own 3D CAD catalog? Once you know this, you can make an informed decision about how to improve product sales from each vendor. The problem was: it used to be a lot of work. To lead the industry, manufacturers have to make these happen for each product, every configurable variation and all their product lines. Option one: you can pay for a full team of CAD experts to manage, maintain and continuously update your CAD library while also providing on-demand custom product configurations and CAD downloads. Smart manufacturers take option 2: host your products within modular, dynamic 3D CAD catalogs. The online product catalog with digital downloads feeds two birds with one scone. It meets customers’ expectations by delivering 3D CAD model downloads, 3D visualization and purchasing information directly from the manufacturer’s website. By streamlining the pathway to purchase, 3D CAD catalogs enhance the customers’ online experience, giving them a reason to return for future purchases. The tool also sets-up manufacturers for success. The catalog does the work of a team of CAD experts – maintaining your product data and delivering CAD to customers – while also looping in marketing and sales with real-time data and customer insights. Additionally, some of today’s 3D Catalog technology can actually future-proof your content so that your products stay current with each new browser, software version and device. With digital product download and 3D visualization readily available through your CAD catalog, your website is optimized for online product sales. But, what about your products on distributor sites? Next problem: Replicate your enhanced product data on distributor and portal sites. Our goal at CADENAS PARTsolutions is to help manufacturers drive revenue and cut costs. That’s why we make it easy for manufacturers to embed their 3D CAD catalogs onto distributor site, vendor portals and mobile apps. Publish your master data one time; distribute to many. We call this concept “One to Many”. We work with you to publish your “master” catalog data one time, and then we use that to insert your catalog to many other locations where you sell your products. Your catalog is the single source of data that outputs to 94 portal sites, your distributors and your mobile app. When you launch a product catalog with us, our experts work with yours to ensure all the product data in your 3D Catalog is accurate and visually how you want it. Later if you decide you want to showcase your 3D product images and provide CAD download on a distributor site, we use the product catalog to do so. In this way, we help you scale your business through your 3D Catalog without requiring any additional work on your team’s end. Using our CADENAS PARTsolutions content syndication service to provide part data, you can republish your catalog with Motion Industries, Kaman, Digi-Key and many more. Again, this syndication requires zero additional work for your team. Our tool builds just what the Distributor needs to display the exact part. And for distributors like Motion Industries that require a UPC code, we built a special program that locates the manufacturer’s code and streamlines link building. You have your digital CAD catalog on your website – why do you need it on distributor sites? Engineers still use distributor websites for product searches. It’s a differentiator for both manufacturers and distributors. Rich product data drives sales for the manufacturer and distributor. This graphic from Godfrey shows the different pathways a manufacturer’s product can get into the hands of customers and end users. The bottom-line: you’re missing out on sales if you disregard distributor sites. To sell your products online, you must understand your buyer’s journey. That means not just answering their needs and pain points but also being available where they go to meet those needs. Online engineers want to see products with rich content. Therefore, they will choose a product from Manufacturer A with rich content over a product they can’t from Manufacturer B. Similarly, engineers will go to Distributor A for product searches if they know they know they can get the exact product they need if Distributor B doesn’t offer it. Notably, having a free CAD download they can test in their design helps engineers determine whether or not to purchase that product. It’s no wonder they prefer products from manufacturers that provide this. It’s insurance for the engineers that the part they see is the part they get, and it’s a differentiator for manufacturers. Rich product data drives sales. Since engineers will prefer to purchase from manufacturers and distributors that provide rich data, they will return there for future purchases. And, they’ll tell their engineering friends and colleagues where they go to get parts. Where to find trusted product data is no secret, and using 3D CAD catalogs to deliver it is no secret weapon. We asked engineers how often they purchase a physical product of a CAD file they downloaded. Their answer: 82% of downloads convert to sales. Adding your 3D Catalog to Distributor sites is great idea, but it still sounds like a lot of work. Lucky for manufacturers, our “one-to-many” program offers a simple solution. Read More: How do 3D CAD catalogs enhance product data, boost sales and improve the digital customer experience? There’s no need for manufacturers and distributors to have a complicated relationship. Streamline your sales efforts and redefine your relationship with your manufacturers by sharing rich product data. You know the end results: happy customers and multiplying sales. Scale your online product sales with a digital CAD catalog. If you’re hesitating, give a call. 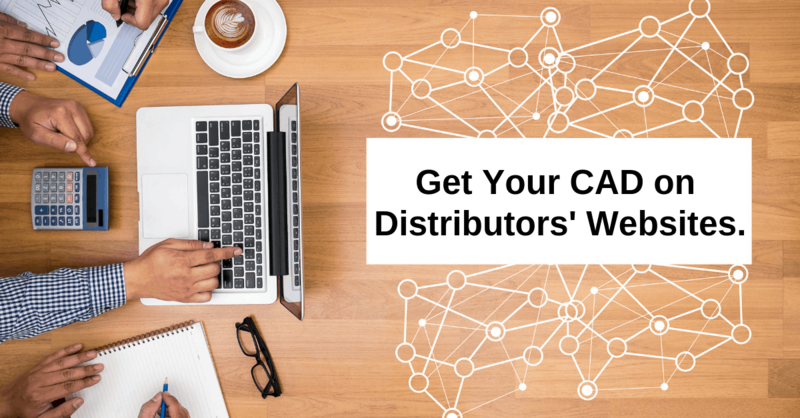 You can learn more about our distributor program and “One to Many” capabilities by requesting a demo with our eCATALOGsolutions experts. VP of Sales and Technical Strategist | Doug has worked at CADENAS PARTsolutions since 2005 serving clients and potential customers with technical and sales-related queries. His wide experience in the industry makes him a valuable resource for customers and member of the CADENAS PARTsolutions team. He lives in Milford, OH with his wife, and they are also a popular vendor at the annual Octoberfest Zinzinnati.